The hammertoe deformity is one of the most common forefoot pathologic conditions encountered by foot and ankle surgeons. When conservative treatment fails, surgical intervention is often indicated. While many surgical procedures have been described, the most common form of correction involves arthrodesis of the proximal interphalangeal joint (PIPJ). When PIPJ arthrodesis is performed, internal fixation with close contact between phalanges is required to achieve a stable union. Traditional fixation of the PIPJ has been achieved utilizing Kirschner wire transfixation and remains an effective option. Common complications associated with surgery include pin-tract infection, toe migration, and patient dissatisfaction. A myriad of lesser digit PIPJ implants have been designed and introduced to offer a more optimal fixation construct. Most designs have shown to be effective with favorable results. 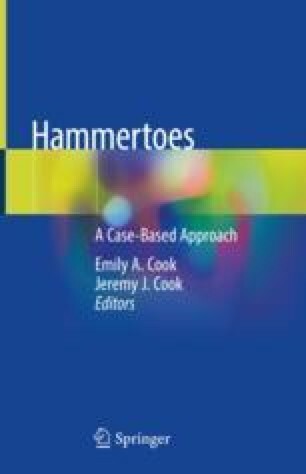 The focus of this chapter will be on the use of an allograft implant to achieve PIPJ arthrodesis in hammertoe correction. This implant’s history, concept, and surgical technique will also be discussed in detail. Currently, the only allograft implant specifically designed for hammertoe correction is the TenFUSETM PIP Allograft (Wright Medical Technology, Arlington, TN).